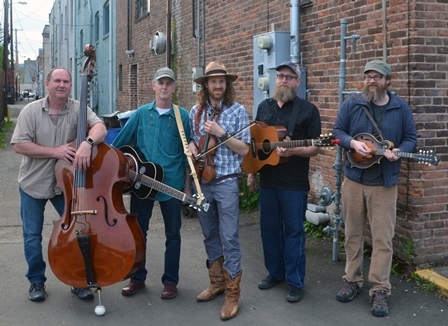 From their home base in Eugene, OR, The Sugar Pine String Band mixes traditional bluegrass with old-time and original americana music. Sit back relax and listen to the sweet acoustic tones of the dobro, mandolin, upright bass, guitar and fiddle. Recently transplanted from the hills of western New York, Gabe Schliffer has been playing cello since the age of four, and writing music since 2007. He has been a member of many different bands including The Cabin Killers, Mulberry Soul, Outland County, and Thy Burden. Stargazers is a continuation of Gabe search into the roots of Americana music, evoking the spirit of jamming around campfires and finding inspiration in the fields and forests of American heartland. His new album features him on cello, fiddle, tenor banjo, guitar as and lead vocals. Gabe has shared the stage with the likes of Donna the Buffalo, Giant Panda Guerilla Dub Squad, Big Mean Sound Machine, The Blind Owl Band, The Prickers, and Thunderbody.